Humanity’s major challenge is providing all human beings with the required conditions enabling them to make full use of the capabilities exclusive to and distinctive of them. It is pressing that we are able to get rid of so many adherences, so many pieces of information and images that entertain us and prevent us from reflecting and deciding on our behaviour. They keep us distracted, as impassive recipients of news —that is, of extraordinary events—hiding the major challenges which at a personal and collective level we should prepare to tackle. It is ethically unacceptable that the unhinged world governance invests 4,000 million dollars per day in military expenses and the purchase of weapons, while —and I do not get tired to repeat this— more than 60,000 people die of starvation and abandonment, of whom 35,000 children from one to five years. These are the challenges, these are the trials, these and no other are the true and unavoidable conscience problems. «A child who dies from hunger is a murdered child», stated Jean Ziegler, former UN Rapporteur on the Right to Food… “Every five seconds a child under 10 dies of hunger”… and the powerful ones look away. We will have to raise a public outcry such as a solidarity movement in cyberspace social networks so that millions of human beings lend ears, contribute and call attention to this issue. I was recently transcribing in my blog an awesome poem by Rosario F. Cartes: «The powerful ones… put in your mouth a planetary hunger… but everything is written in the downed heights of those child eyes, your child cried over, our child forgotten. And the dignity of their ashes is our own indignity». It is pressing to dignify that indignity of ours by acting, sharing, demanding the rulers to stop confusing us with financial issues, stock exchange values, risk premiums and bank holes, and assume their supreme responsibilities. Pedro Salinas wrote La voz a ti debida, The Voice Because of You. It is urgent that action be taken by the people, raising their voices for the historical turn that needs to be accomplished to overcome this systemic crisis; a voice of life due to all who suffer the consequences of extreme poverty. 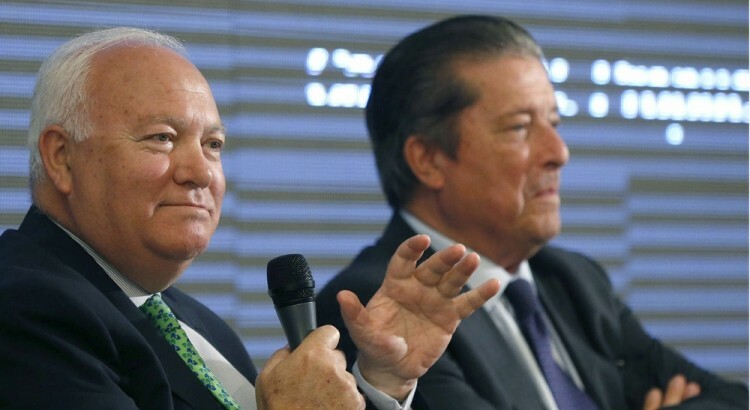 This is the voice, almost a cry, calm but firm, raised by Miguel Ángel Moratinos, with his deep knowledge of the intricacies of the world situation. In the front row of solidarity action, that he so staunchly fostered during the years in which he held the Foreign Affairs and Cooperation portfolio of the Spanish Government, Miguel Ángel Moratinos has written this book, The STRUGGLE AGAINST HUNGER, in which, in addition to underlining the major lines of starvation in the various continents —prosperous countries included—, he puts forward the solutions that could straighten out this essential issue concerning us all. ∗ Food (agriculture, aquiculture, biotechnology). ∗ Water (damming up, conduction, management, production). The guarantee of food supply is part of the Declaration and Plan of Action for a Culture of Peace adopted by the United Nations in October 1999. It could not be otherwise: the radical change which would be entailed if we went from words to action would bring about, in the first place, the eradication of this insult, of this inapparent fratricide. Not only must we feed more people —due to the demographic increase, so strikingly moderated— but also longer, due to the longevity increase. Both are goods news. Humanity has the necessary knowledge to ensure this supply. What is required only is that a part of the immense funds committed to the security of a few is transferred to the nutrition of all. “Food is the first of medicines, the most important of treatments”, I said in the presentation of a scientific session by the Spanish Royal Academy of Medicine precisely dealing with food production. The author, being aware of the conceptual value of speaking in the plural first-person pronoun, we, has made of the care about those in need, with the extraordinary international background he has, his basic dedication in the third stage of his life and his extensive and outstanding career. He underlines it in the introduction to this excellent publication, stating that he has the “enthusiasm, commitment and strength to keep on going forward in the struggle against hunger, poverty, inequality”. And he adds: “The history of humanity is closely linked to the human struggle for survival, which has as its first condition the securing of food needs. It was when human communities settled, became sedentary and found an ideal space to get food to feed them that the progress of humanity really started». «The Millennium Summit, —he adds later on— with its eight development goals, set hunger and extreme poverty as its first task for 2015». But, as could be expected, the funds contributed by globalisers did not allow envisioning more ambitious goals and, then, having the necessary means available to achieve them. It is essential to put ethical values —social justice, freedom, equality and solidarity— back in the governance guide at all scales (either local, national or global). And for that purpose, it is also essential that it is the peoples, as lucidly put forward by the first sentence of the Charter of the United Nations, who take the reins of their common destiny. It is necessary to abandon without delay the plutocratic groups that have pretended in vein to take on the duties that the UN should have carried out, and quickly put forward a democratic multilateralism allowing the new start heralded by the Earth Charter for this beginning of the century and the millennium. Only in this way, and if we can achieve that quickly millions and millions of people, thanks to the new communication and information technologies, feel stinged, as in the verse of Miguel Hernández, by a hungry child “as an imposing thorn”, will we be able to carry out the major transformations that are inescapable. I thank Miguel Ángel Moratinos for this contribution, for the political and ethical commitment it represents, which shall enable, I am certain, to significantly contribute to achieving that in a few years time citizen power attains major breakthroughs in these essential issues for the dignified life of all human beings and to avoiding that the terrible sentence of Albert Camus comes true: “I despised them because being able to do so much, they ventured so little».